Cook the pasta according to package directions. Saute the garlic and onions in the olive oil in a saucepan over medium heat until soft. Pour in the vodka, being careful if your stove has an open flame. 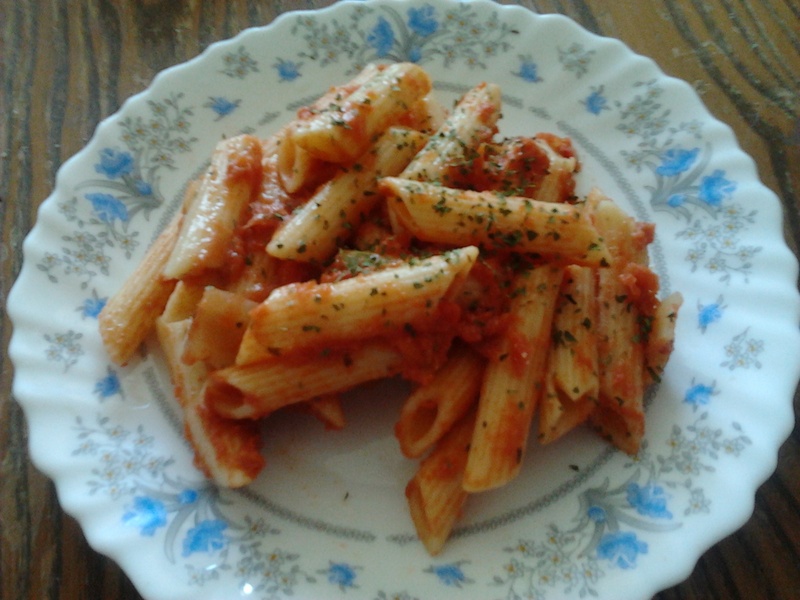 Cook and reduce for 2 to 3 minutes, then pour in the tomato puree. Stir the mixture until it’s thoroughly combined, then reduce the heat to low. Pour in the milk. Stir to combine, then turn heat to the lowest simmer possible. Sprinkle in the basil and parsley and add salt and pepper to taste. Pour the drained pasta into the sauce and toss to combine. Sprinkle on the Parmesan cheese or garnish with fresh basil leaves. This entry was posted in Dairy, Vegetarian and tagged crushed tomatoes, low-fat penne alla vodka, pasta dishes, penne alla vodka, penne pasta, skim milk, vodka. English muffins are one of my Dad’s favorite breakfast treats. He would (and maybe still does) buy them fresh every Sunday morning, cut then in half, toast them, and smear them with butter or cream cheese. Sometimes we would use them as bases to make miniature pizzas (so adorable and edible). English muffins are essentially savory muffins involving yeast. If you have made rolls, this recipe is not a far stretch. The slightest difference in cooking techniques is that they are baked on a pan rather than in an oven. Since English Muffins are scarce where I live, I baked a batch on my own. 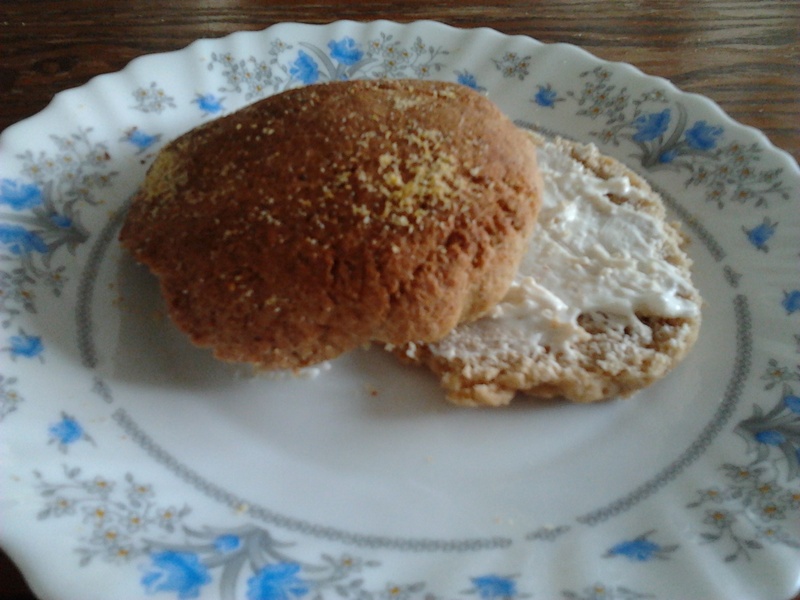 I can’t remember when I last had an English muffin. I decided to adapt a gluten-free version using oat flour. If you don’t like oat flour or can’t find it where you live, you can use any flour you want. Like any home-baked goods, English muffins taste their best when made from scratch. I hope I do my Dad proud with this recipe. In a small bowl dissolve yeast and sugar with water and milk. Set aside for 5 -10 minutes and let it bubble. In a large bowl, mix 3 cups of flour, oil, and yeast mixture. Beat till smooth. Add salt and the remaining flour and kneed. Cover dough with plastic wrap and let it rise for 45 minutes or until double the size. Punch the dough down. Roll out about to 1/2 inch thick. Cut rounds using the rim of a cup or a biscuit cutter. Sprinkle baking sheet with cornmeal and place these muffin disks on it. Dust top of muffins with cornmeal. Cover and let it rise for another 1/2 hour. Heat greased griddle over low-medium flame. Cook muffins on the griddle for about 10 minutes on each side. Keep these muffins warm oven until they have been completely cooked. Allow to cool and store in ziplock bags. This entry was posted in Bread, Gluten Free, Vegetarian and tagged English muffins, Gluten-Free, oat English muffins, yeast. This healthy version was based on the original recipe in one of my cookbooks. I honestly never heard of fennel until I saw that particular recipe. I also generally don’t like parsnip. But this recipe made me have a change of heart. After I gave this recipe a whirl, I decided to recreate a healthier version by omitting the milk and heavy cream. I personally felt that this parsnip fennel soup didn’t need any of these ingredients. Aside for extra creaminess, they add calories and fat. This parsnip fennel soup is an unexpectantly delicious combination of winter flavours guaranteed to convert even the most ardent parsnip haters! 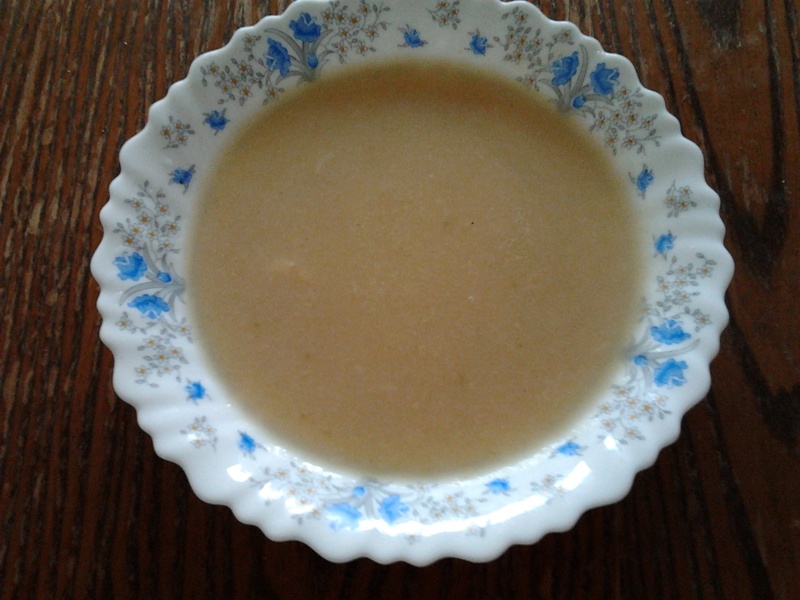 Although I’m still hesitant to eat parsnip alone, I haven’t been as fastidious to eating it pureed in a soup. For a tasty vegetable soup, try this parsnip fennel soup flavoured with a touch of cumin and dill. Heat 1 tablespoon of olive oil in a stock pot over medium flame. Add onion and saute till translucent. Add the other vegetables and seasoning and saute for 10 minutes or until vegetables soften. Pour in 5 cups of vegetable broth or water. Cover and bring to a boil. Lower flame and simmer for 25 minutes. Puree with a hand blender or in batch with a blender. Serve hot and garnish with a dill spring (optional). This entry was posted in Gluten Free, Soup, Vegetarian and tagged Fennel, parsnip, parsnip fennel soup, soup. Who won’t go for good ‘ole guacamole? This creamy avocado dip is too hard to resist. At every even I’ve been to that served this dip, it was licked clean in a matter of seconds. Since Cinco de Mayo is coming up in a couple of weeks, I thought I may share a guacamole recipe that is appropriate for the occasion. I’m sure most of you are not new to the concept of mashed avocados. After all, guacamole is only made of ripe avocados, lemon or lime juice, a bot of chopped onions, salt and pepper for taste. Not too complicated, huh? 🙂 Some of you have have seen many variations of guacamole recipes and have tasted them. My mother makes it with mashed hard boiled eggs. Some add a bit of mango. Others may throw in some chopped tomatoes. My personal favourite is guacamole with a splash of tabasco sauce. 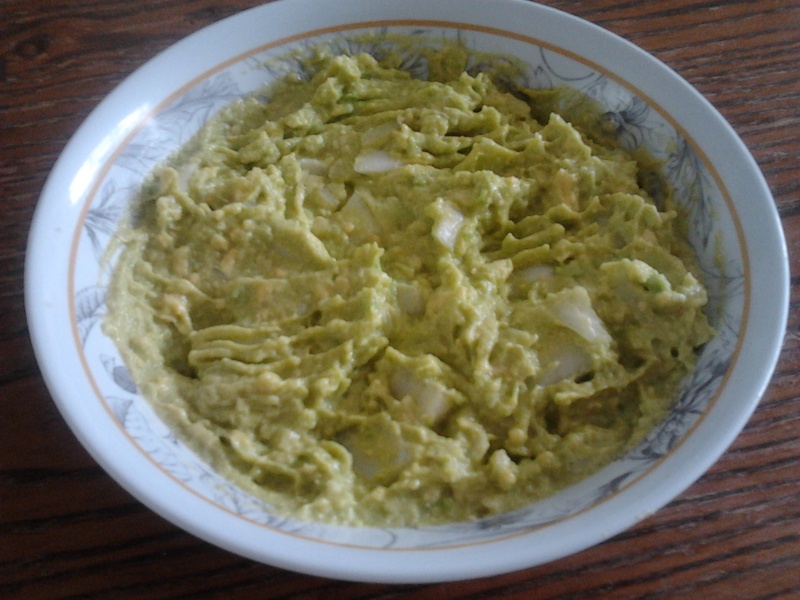 But I’ve decided to share my classic version of guacamole. After that, you can create your own variation. Its best to serve guacamole as soon as its made. If you don’t plan on serving it immediately, the best way to prevent the guacamole from browning is by inserting an avocado pit in the middle and keeping it covered and chilled. Guacamole looks the most appetising when its bright green. I don’t want to begin to share my thoughts with you on how it would look browned. It certainly wouldn’t be appealing to the eye nor a crowd pleaser. Guacamole makes a great dip for corn chips, cut-up raw vegetables, and crackers. Sometimes I will use guacamole as a smear over sandwiches or burritos. In a medium bowl, mash avocados, lime juice, salt and pepper together till smooth and creamy. Mix in onion and cilantro. Stir in cayenne pepper. If not serving right away, stick an avocado pit in the middle, cover and refrigerate for an hour. This entry was posted in Gluten Free, Vegetarian. I can’t explain why I have been having a hankering for chicken with duck sauce as of late but I have. One plausible theory speculates that I haven’t had chicken with duck sauce in a very long time. Another explanation suggests that I generally like good Asian condiments which are hard to find where I live. That is what prompt me to try to make my very own duck sauce. When I saw how easy it was to make, I’ve decided to try it out for myself. 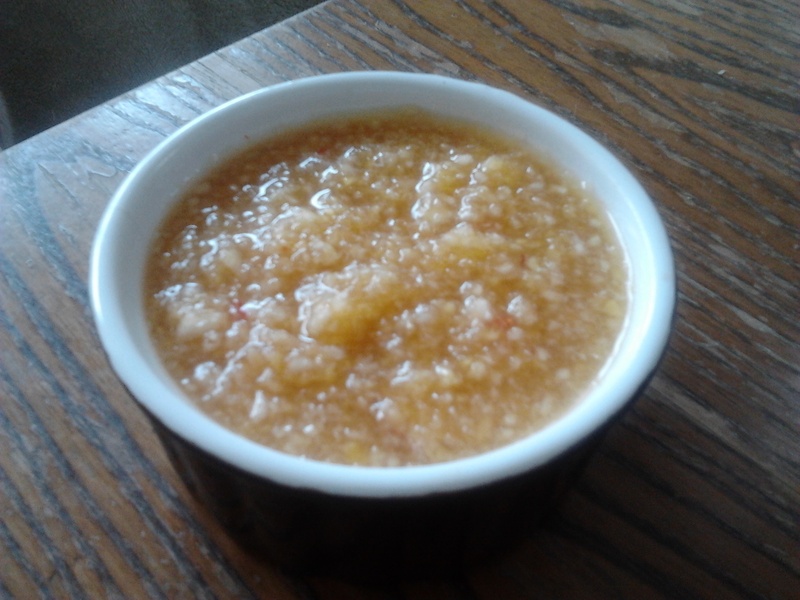 The ingredients for duck sauce basically consists of apples (or apple sauce), apricots (or apricot jam), chili sauce, rice vinegar and soy sauce. That’s all. Since I am not such a huge fan of jams (as they are generally too sugary for my liking), I’ve decided to use the actual fruit and puree it. I know apple sauce and jams are great shortcuts and normally save you the time from having to process or puree anything, using the fruits are generally healthier. Since I couldn’t find any decent looking apricots, I opted for nectarines. They had to suffice for the time being. While a lot of people associate duck sauce with Asian cuisine, duck sauce originated from the Unites States. It was served with deep-fried pressed duck, which had no sauce of its own. Duck sauce became popular as a dip for any food — from spareribs and egg rolls to almost anything else imaginable. Not to mention that they make great marinades as well. There are so many versions of duck sauce that it is hard to decide which kind to make. No matter which variation you decide to make, duck sauce is suppose to be sweet and sour with a slight kick. You don’t have to agree with me but I do think that preserves can be very overpowering but ultimately, its your decision to use any ingredient that is convenient for you. Don’t worry. I completely understand why you wouldn’t want to use your food processor or blender to smooth out apples and fruit. I admit that I had moments where I felt too lazy to do anything tedious and was looking for easy and less time consuming options. This entry was posted in Gluten Free, Vegetarian and tagged Apples, apricots, Chicken, duck sauce, nectarine, Soy sauce. I know that Thanksgiving and Passover has long passed over (I think I may have already cracked this pun a couple blog posts ago. I know. Its stale like crackers from a couple weeks ago. Or in this case, matzah), but my desire for stuffing never does. ANd it never waits for any of these holidays to kick in. Whenever there is turkey, duck, or a whole chicken present, farfel/stuffing is the requisite accompaniment. 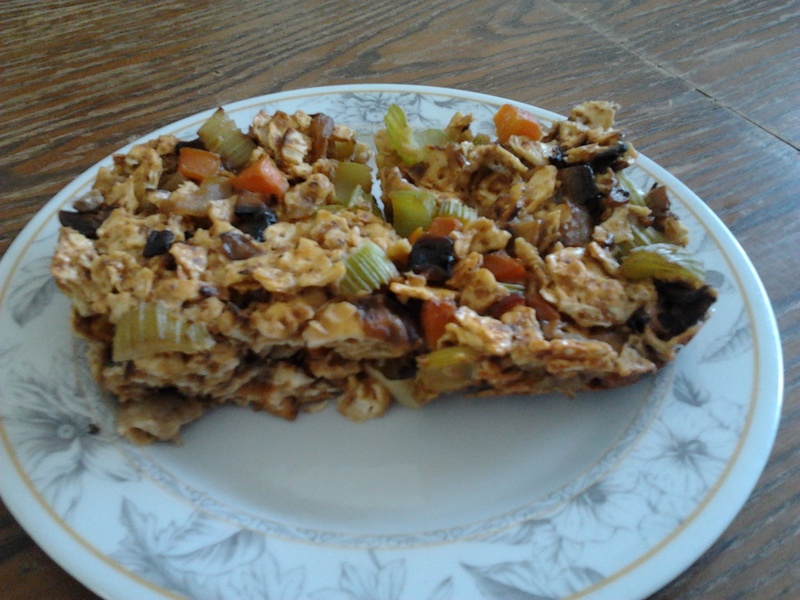 What is a better way to utilize stale matzah other than to make farfel or stuffing. If you don’t like matzah or have grown tired of the sight and taste of it like I have, you can use crackers or stale bread. This recipe would work well with either ingredient. This farfel/stuffing recipe is rich in many flavours and doesn’t require an excess amount of cream, butter, and eggs. You can throw in a bit of low-fat shredded cheese. Leftovers taste their best when there is any. Preheat oven to 350 degrees F. In a greased skillet over medium-high heat, saute onions till translucent. Add the garlic and saute for another 2 minutes. Add the vegetables and saute till softened. In a bowl, combine crushed matzah/crackers, eggs, parsley, salt, and pepper. Pour in broth and stir. Toss in sauteed vegetables and set aside until liquid is absorbed. Transfer into a lightly greased baking pan. Bake for 3o minutes. This entry was posted in Bread, Side Dishes, Vegetarian and tagged carrots, Celery, crackers, farfel, matzah, Mushrooms, onions, stuffing. It seemed ages since I published a salad recipe. This butternut squash arugula salad recipe with cashew nuts recipe was inspired by a similar salad I’ve eaten at a local cafe a while ago. I’ve substituted sweet potato for butternut squash and it worked out pretty nicely for me. I made this version when we has company last week. It was consumed within minutes. While I love squash, the cashew nuts were the highlight of this salad. At least they were to me. They add a crunch to the salad which I like. While this salad has arugula, you can use mixed greens if you can’t find any. My biggest issue with mixed greens and arugula is the bitter aftertaste. That is why I need to use other components when making a salad using them. A bit of balsamic vinegar will slightly tame the bitter flavour of these leaves. If you don’t like squash, you can use carrots or mangoes. You can’t go wrong with this salad unless you overdress it since mixed greens and arugula tend to wilt easily. Its best to dress this salad right before you are about to serve it. This butternut squash arugula salad with cashew nuts make a wonderful barbecue or picnic salad. Toss in squash, arugula, and onion in a salad bowl. Lightly dress with oil and balsamic vinegar. Toss in cashew nuts. Serve immediately. 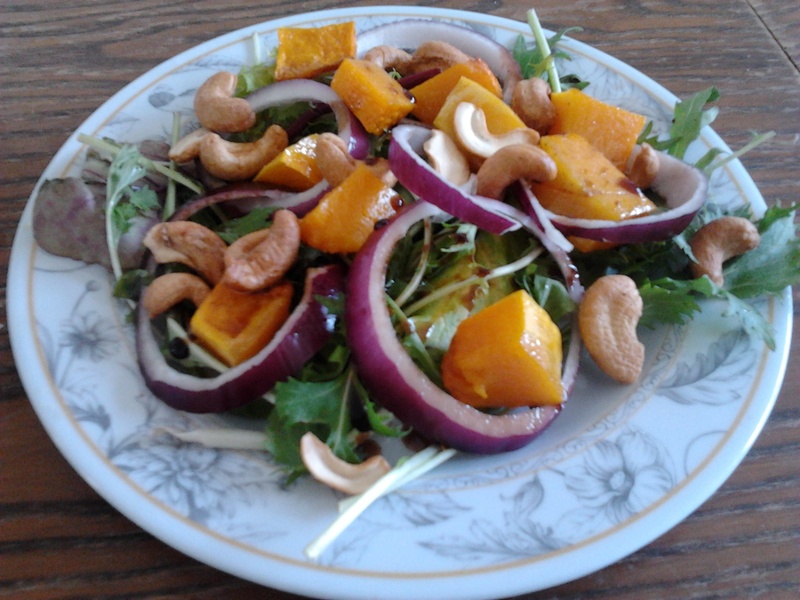 This entry was posted in Gluten Free, Salad, Vegetarian and tagged butternut squash arugula salad, cashew nuts, mixed greens, red onions, Salad.